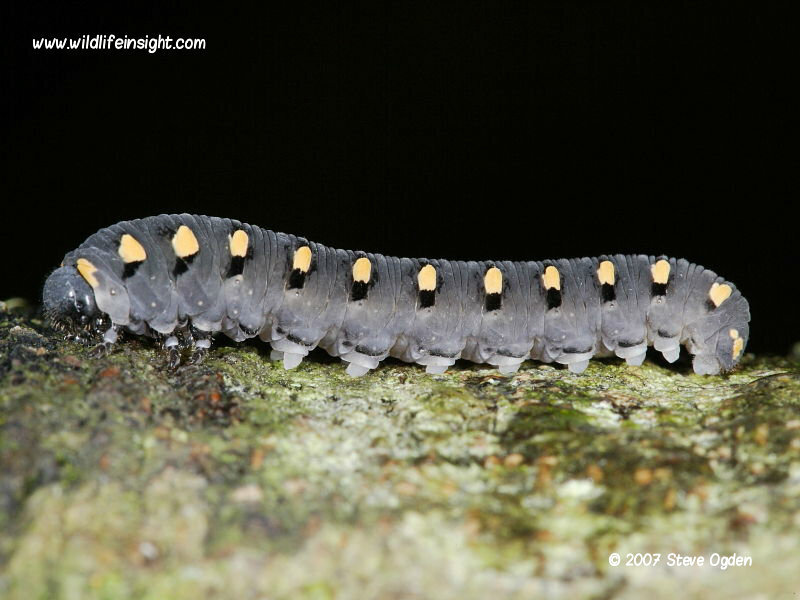 Sawfly caterpillars (larvae) are often confused with the caterpillars of butterflies and moths. This sawfly guide and photographic gallery is in response to the many caterpillar identification requests received for sawfly caterpillars from both wildlife observers and gardeners. Included are tips on identifying commonly sighted sawfly caterpillars from those of other insect larvae and includes photographs of them on commonly associated foodplants. This information will hopefully help gardeners decide if action is warranted to control caterpillar infestations. Sawflies are a member of the Symphyta sub-family of the insect order Hymenoptera, a much under-researched group of insects with in excess of 400 species in the British Isles. It’s probably fair to say that for every plant there is likely to be a species of sawfly caterpillar that will feed on it. The adult sawfly and caterpillars of many species are very similar and difficult to identify to species with certainty. Knowing the host foodplant can help. The insects derive their name from the saw-like ovipositor the females of some species use to cut open or drill holes in plants, forming a cavity into which they then lay their eggs. The photograph left shows a female sawfly cutting into the stem of a garden rose in preparation for laying eggs. The resulting batch of eggs are shown below. Whereas the adult sawflies may go unnoticed the caterpillars of many species attract attention by the severe defoliation they cause when feeding in large numbers on a single plant. Other caterpillars can be seen in the following galleries and species pages. Sawfly larvae come in a fascinating variety of shapes, colours and sizes – most ranging from 10-40mm in length. For many species the most useful way to determine whether a caterpillar is a sawfly is to count the legs. Although, on smaller caterpillars this can be difficult. 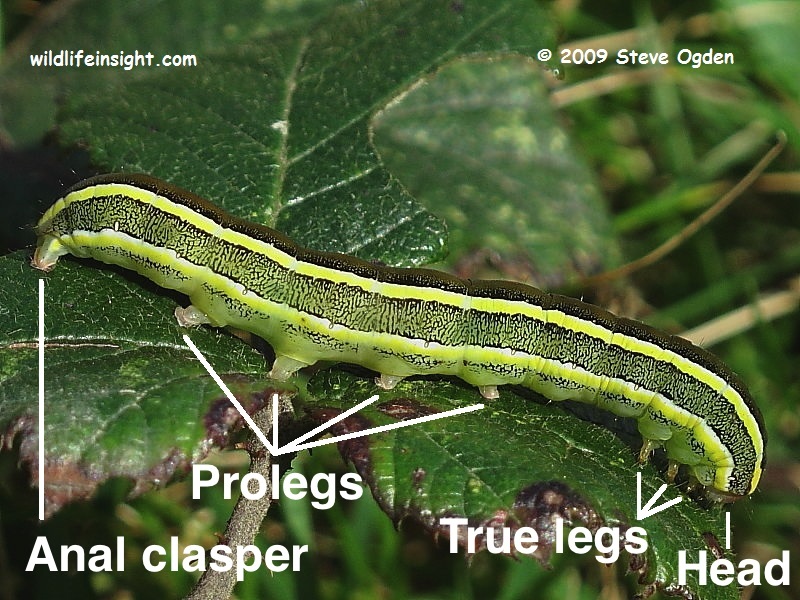 Sawfly caterpillars have three true legs at the front, the same number as many other insect larvae, but have more ‘stumpy’ prolegs, five or more, extending down the abdomen. This can give the impression of an almost continuous line of legs (images above and left). 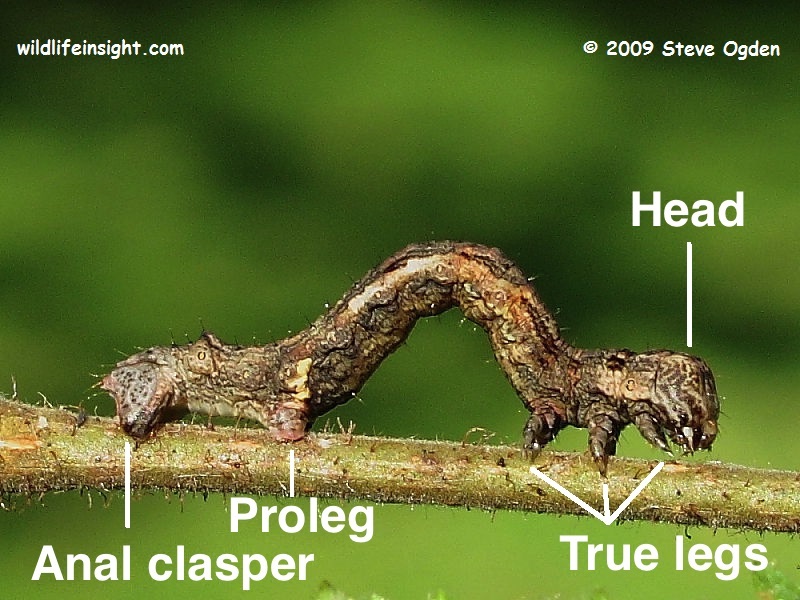 Moths and butterfly caterpillars have a maximium of four prolegs and a rear clasper. Comparison examples of the most common leg arrangement of caterpillars belonging to the two largest moth groups the Noctuidae and Geometridae are shown above. The gallery featured below contains photographs of some of the sawfly larvae commonly recorded on a variety of trees, garden shrubs and plants. Some species have a common name reflecting the foodplant. However, many species are polyphagous, feeding on a number of different plants. Due to the close similarities of many species identification may be uncertain from a photo and recorded as either probable, belonging to a likely family or with reference to the hostplant. Confirmed identifications are well received. For those having identified their caterpillar as that of a sawfly and wishing to learn more there is an excellent on line Symphyta forum on which expert help is available to identify specific sawfly species. Thanks to all those who’ve sent in sightings. As with the other galleries it will continually be updated with new sightings. 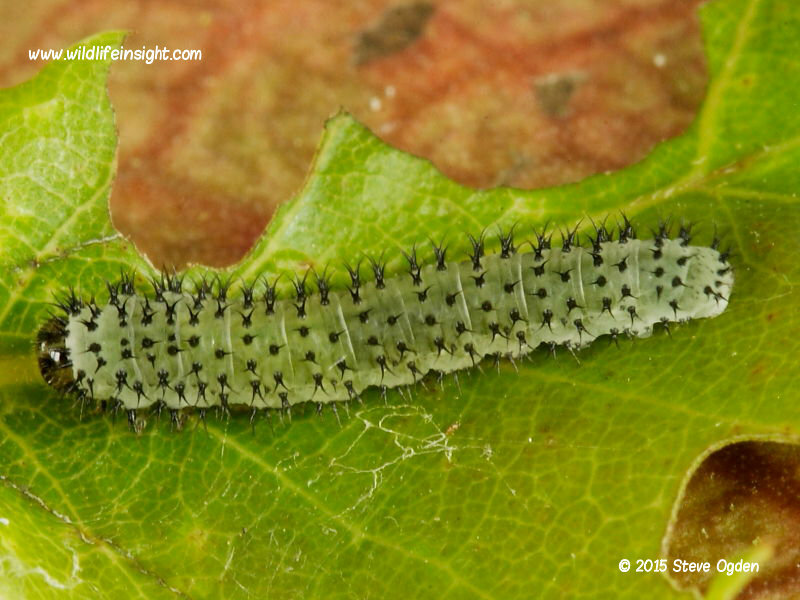 For other caterpillars see British Moth caterpillars, British Butterfly caterpillars, North American caterpillars and ‘coming soon’ European caterpillars, African caterpillars, Sphingidae caterpillars and Saturniidae caterpillars. As might be expected a large number of different sawfly species have caterpillars that feed on oak trees. Sightings of sawfly caterpillars feeding amongst the needle leaves of pine trees are common in areas of conifer forests. Diprion pini, often referred to as the Common Sawfly or Conifer Sawfly, is a pest of pine trees throughout much of Europe. The larvae develop orange heads in late instars. Worldwide there are several other species of sawfly caterpillars that feed on pine trees. Those shown below (bottom) from Canada are considered likely to be Diprion similis. A number of sawfly species have caterpillars that include willows and sallows amongst their larval hostplants. Some feed gregariously while others are solitary. The large number featured below on the trunk of a willow tree and spilling over onto some railings are likely to be a Nematus species of sawfly. The caterpillars of the Social Pear Sawfly, Neurotoma saltuum, form protective silk webs that are sometimes mistaken for the webs of several species of moths. When on Hawthorn they are most easily confused with the caterpillars of The Hawthorn Moth, Scythropia crateagella. 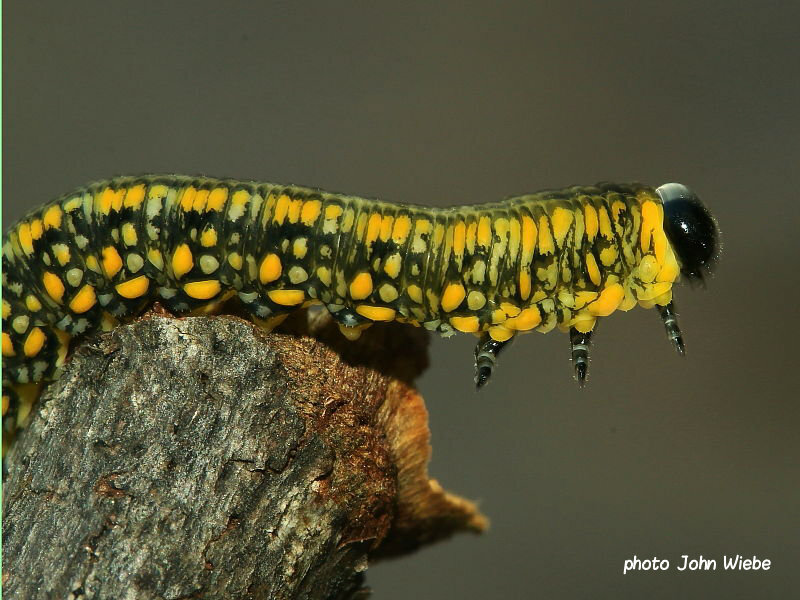 Two of the most common species of sawfly larvae to feed on the leaves of pear trees are the Social Pear sawfly, Neurotoma saltuum, and the Pear Slug Sawfly, Caliroa cerasi. The Social Pear sawfly caterpillars form a web as feature above. The Pear slug sawfly caterpillar, Caliroa cerasi, as the name suggests looks more like a tiny slug. Fenestrations in pear tree leaves, where only one outer skin of the leaf is eaten, are often signs of feeding Pear Slug caterpillars. 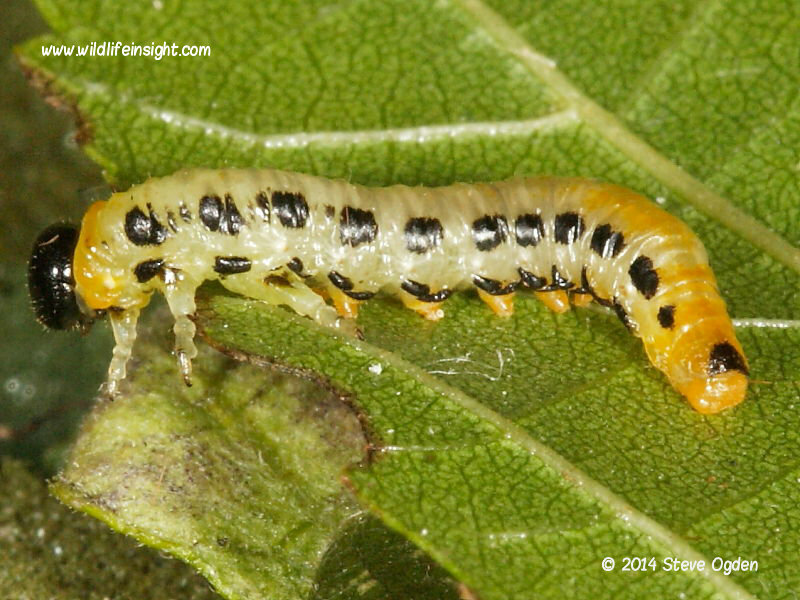 Social Pear sawfly larvae are also found on cherry trees as well as hawthorn and pear trees. More sawfly caterpillars that feed on a variety of fruit trees will be added shortly. 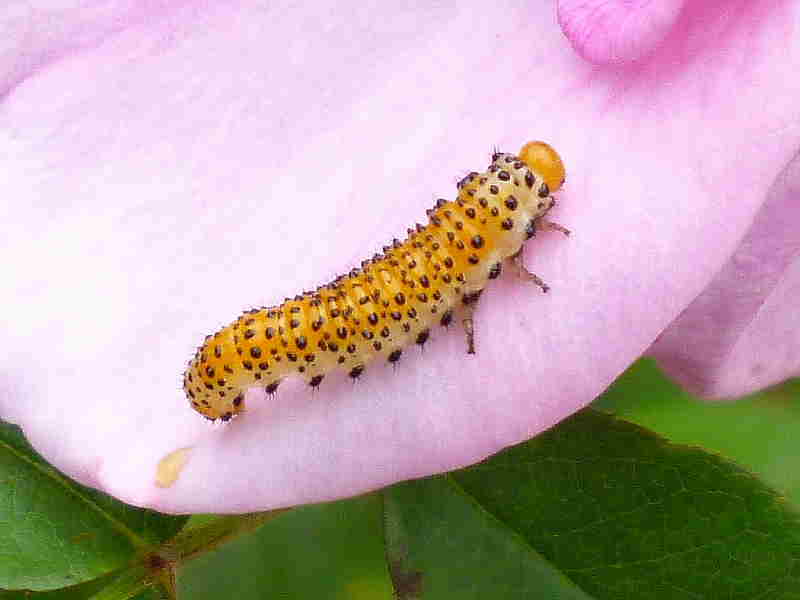 Many species of both cultivated and wild species of rose are hosts to sawfly larvae. Leaves are commonly denuded of leaves leaving just skeletal leaf veins. 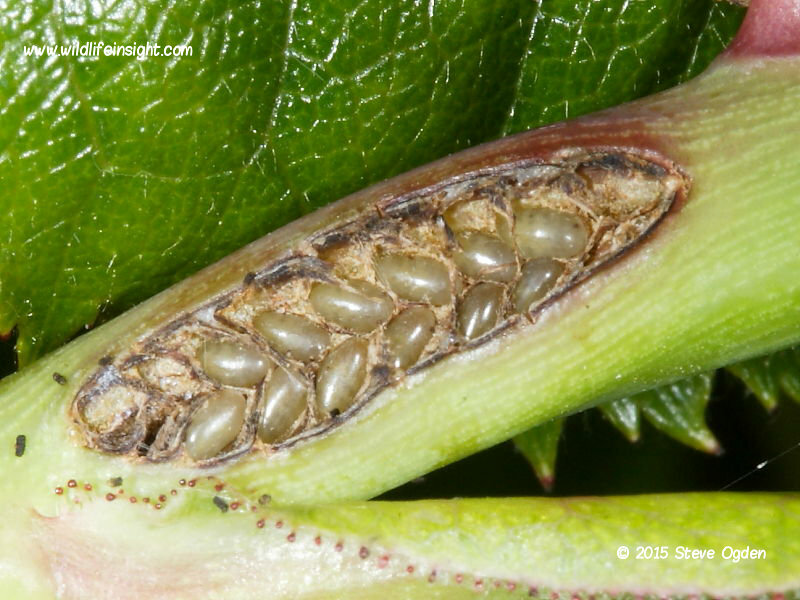 There are several different species of sawfly larvae that feed on rose bushes. However, due to their similarities, all species are often referred to by gardeners as Rose Sawfly larvae. Solomon’s Seal is a popular garden plant that’s commonly infested with large, creamy white, black dotted caterpillars better known as Solomon’s Seal Sawfly, Phymatocera aterrima. Solomon’s Seal caterpillars are renown for defoliating the host plant. Frequently only a skeleton of leaf ribs is left by the time the caterpillars are fully grown and ready to pupate. The Yellow Iris that’s often planted in damp areas around garden ponds is commonly fed upon by the Iris sawfly, Rhadinoceraea nicans. The caterpillars are frequently found feeding gregariously on waterside irises and may cause severe defoliation. More photographs, information and sightings of Iris Sawfly will be added shortly. A caterpillar frequently found in gardens and the countryside is the caterpillar of a sawfly often referred to as the The Honeysuckle Sawfly. One of several similar species is Zaraea fasciata. The caterpillars may be found feeding in large numbers both on cultivated honeysuckles such as Leycestaria formosa, The Himalayan Honeysuckle and native wild species of honeysuckle. The Berberis sawfly, Arge berberidis, has caterpillars that feed gregariously on species of berberis and mahonia shrubs and may cause severe defoliation. This is a relatively recent colonist to gardens which appears to be spreading to many parts of the UK. More information and sightings to follow. Many species of sawfly have caterpillars that not only feed on the leaves of plants but also on a wide variety of flower heads. More sightings and information to be added shortly. A number of different sawfly species have caterpillars that feed on a wide variety of vegetables. A number of caterpillars of butterflies and moths can also be pests of vegetables. One of the biggest pests of Gooseberry bushes on many allotments and gardens are sawfly caterpillars. Several species are often referred to as Gooseberry Sawflies. Other common names are Spotted, Common and Small Gooseberry Sawfly. The caterpillars can also be found on Red and White Current bushes. When in numbers the larvae strip the bushes of leaves leaving just the stems. 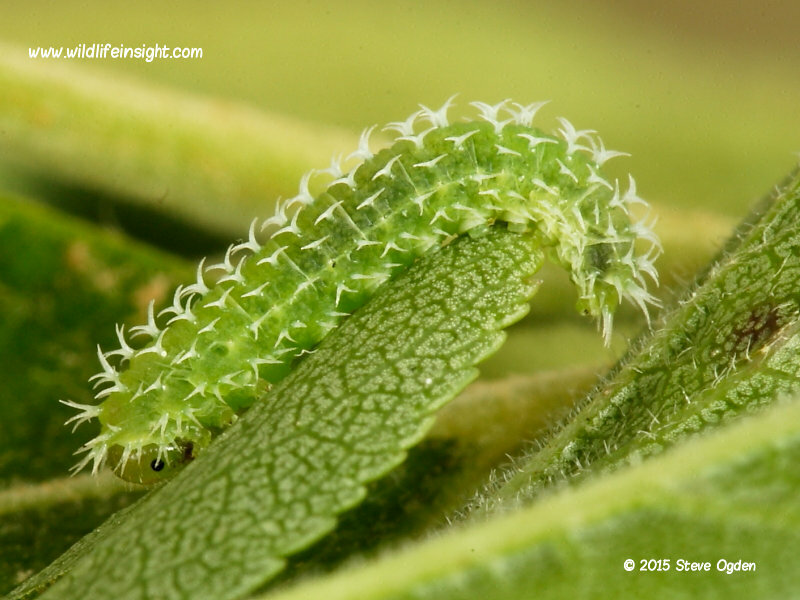 The Skullcap sawfly caterpillar, Athalia scutellarinaea, is an uncommon species that feeds on species of Skull Cap. Often considered a weed, Figworts are found growing in many wildlife-friendly gardens. The Figwort Sawfly is commonly found in gardens. The large, creamy white larvae feed on species of figwort. When infested by large numbers of caterpillars the plants are often completely defoliated. More sightings and information to follow shortly. Sawfly caterpillars are not always found on the foodplant. 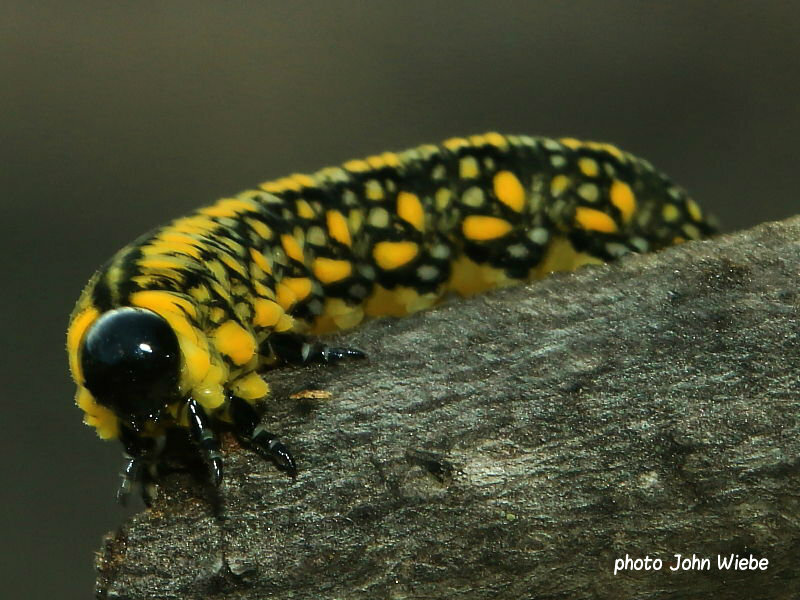 When fully grown and ready to pupate sawfly caterpillars may be found wandering on the ground. They may also be found on the ground if the foodplant has been depleted, forcing them go in search for another food source. Shown are photographs of sawfly caterpillars not found on a specific foodplant. How to control or eradicate sawfly caterpillars ? Once identified, gardeners understandably then want to know how to control sawfly caterpillars. This isn’t always so simple as the use of pesticides can have a detrimental effect on beneficial insects, resulting in a loss of pollinating bees and natural garden pest predators such as hoverfly and ladybird larvae. Prevention and removing recently hatched caterpillars is the best solution. A little time spent checking susceptible plants such as Roses and Solomon’s Seal in the spring and early summer is often effective. Adult sawflies may be spotted and any dark slits in stems containing eggs can be scraped out. Tiny windows appearing in leaves are often the first signs of hatching and feeding larvae. These leaves, complete with clusters of caterpillars, can easily be removed before the caterpillars have time to grow and spread to the whole plant. Another effective method is to place a bucket underneath the leaf and flick the caterpillars into it using a feather or paint brush. If large caterpillars are found it’s surprising how effective it can be to spend a little time picking them off. Fortunately, even during the day, when many other caterpillars hide, sawfly caterpillars are often easy to spot. Fully grown sawfly caterpillars pupate in either leaf litter or the soil. Some species can have several generations. The turning over of soil to expose the pupae and removal of leaf litter can help reduce the number of emerging sawfly. When will sawfly caterpillars stop feeding and disappear? Quite often it’s just after a period when the caterpillars are at their most destructive that they suddenly disappear. This may be because either the food source has become depleted and they have to go in search of another plant, or they are fully grown and wander off in search of somewhere to pupate in the soil or leaf litter. The time period from hatching to pupation can be less than a month for many species. 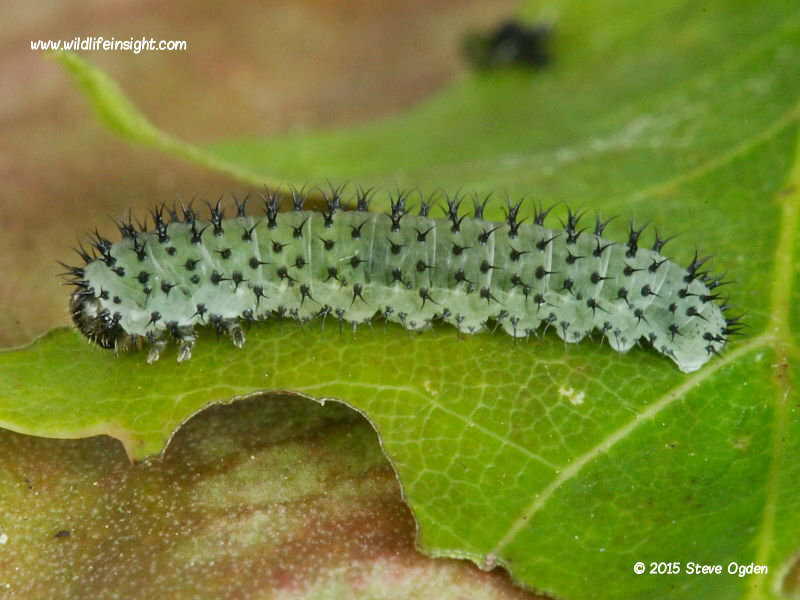 Will plants recover from a sawfly caterpillar infestation? Concern for the welfare of the plant is understandably the gardeners main concern. In general, a healthy tree, shrub, fruit bush or perennial flowering plant won’t suffer long term damage as a result of a single sawfly infestation. However, repeated attacks may cause weakening of the plant, leave it susceptible to disease and fungal infection, as well as stunt growth.